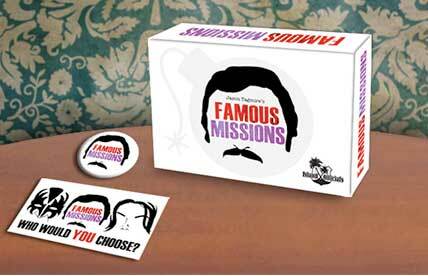 Famous Missions is a party game where players put together their best team of famous (and sometimes infamous) personalities to handle the mission at hand. You need to dismantle a bomb, QUICKLY! You look around and see George Lucas, Donald Trump, Oprah, Gene Simmons, Danny DeVito, Joan of Arc and Shaquille O’Neal. Who will you choose? Choose 3 and defend your choice. You’ll need to argue for them later. Those are the basics. The game plays with as few as 2-3 people, and as many as you can deal out cards.A great game for late nights with creative friends, and will be sure to end in a riot (the good or bad kind). 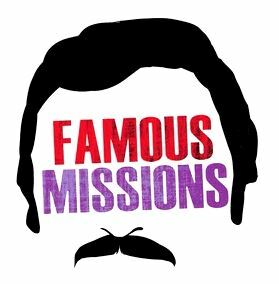 Famous Missions can be a very creative game where you use your knowledge of celebrities (good and bad) to your advantage. You can also use your skills in BSing the other players, referencing facts about the celebrities that may or may not be true. For fans of Cards Against Humanity, The People’s Court, The Leonard Maltin Game, Wikipedia, arguing, Burt Reynolds, and random useless knowledge.